We are writing this letter to urge you to take action to rectify a grave injustice being done to us and thousands of other European athletes. Sport is for us more than a leisure activity. It is our profession. We work in an economic sector that is mostly regulated by international sports federations. More often than not, those rules are disconnected from the interests of those that matter the most: the athletes. In our sport, speed skating, the international federation (International Skating Union, ISU) prohibits athletes, officials, coaches, and even volunteers (!) from taking part in sporting events that are not sanctioned by the ISU. If we would participate in such events we can expect to be banned for life from all ISU competitions (including Olympic Games, World Championship, etc.). As such, the federation effectively denies our right to participate in alternative events that do not conflict with the official ISU competition calendar. The far-reaching restrictive effects of this prohibition became manifest when an independent organizer, Icederby International, took the initiative to organize out-of-season international speed skating events. Such new initiatives are welcome opportunities for speed skaters to make a better living out of their profession. The numbers speak for themselves: an individual short track speed skater winning all the ISU competitions in a typical season would earn around 25.000 EUR. This is less than what the same skater would receive for merely appearing in a single, two-day Icederby event! The ISU, however, prevents us from seizing this and any other future opportunity without any valid justification. To remedy this injustice, we filed a competition law complaint with your services in June. The ISU’s regulations and conduct are in clear breach of the European competition rules. In this case, European athletes, workers, and citizens would directly and visibly profit from the promotion of fair conditions for competition. Or are we to believe that international sports federations are exempted from these rules? 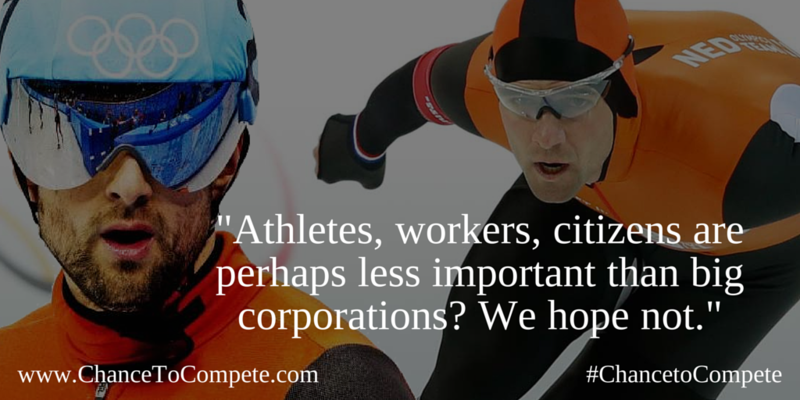 Athletes, workers, citizens are perhaps less important than big corporations? We hope not. The ISU’s abuse of its worldwide monopoly position can only be tackled at a supranational level. And the stakes are high. This is not just about speed skating. In numerous other sports, international federations impose similar restrictions on athletes. The European Commission now has the chance to set an important precedent that would put an end to these abusive practices once and for all. Ms. Vestager, we count on you! Mark Tuitert, Olympic Champion 1500 meter. Niels Kerstholt, World Champion short track.